The blog post on the video about reverend Wade Watts vs the KKK turned out to be very popular. So let us here help the reader identify another key behaviour that helped the reverend achieve such an inspiring outcome. The behaviour? Remaining constructive. Often we don’t have a good understanding of what we really want (our interests or needs). Often we set an outcome that on the face of it looks good to us, but we haven’t fully understood all the negative reactions, and unintended consequences of that outcome. Often we set a goal for what we want that is completely incompatible with what the other party wants, so they will resist us every step of the way instead of working with us. Often we lack the creativity or tools to figure out exactly how to reach that desired outcome. A passive and unproductive state of wallowing in painful feelings of regret, resentment, hurt, uncertainty or hopelessness. An active state of pursuing unconstructive goals such as identifying fault, placing blame, or getting even with those person(s) we consider to be obstacle(s) to progress. 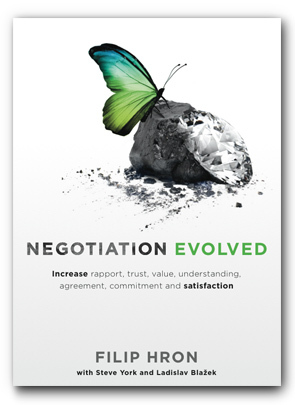 As effective negotiators we instead consistently keep our eyes on the prize. We avoid getting caught up in our own emotions. We seek to stay rational, proactive and constructive. Every step, action or behaviour we take is the best step towards the desired outcome. It doesn’t matter if we just failed, if someone let us down, or if we experienced bad news, bad luck or negative surprises. We consistently pay attention to the desired outcome, and then we make sure that our next step is one that is most likely to move us closer to that outcome.